I love the idea of living simply. Without loads of material possessions nor a packed schedule. Since this is what minimalism can achieve, I think I'll give it a shot. With even more determination anyway! I have a pretty minimalist wardrobe after some work over some time, and love it; it works really well for me. In addition, I have embraced "the one in, one [or two] out" decluttering method, so I am officially challenged/ concerned how much more I can change. For awhile now, I have followed blogs whose authors have gotten out of debt and who aspired to live a more simplified European lifestyle. Through these subjects, I stumbled upon the very inspiring community of minimalists online. I can see how owning less and, in turn, hopefully wanting less will aid in struggles with debt. You see, I have a lot of debt myself- of the credit card and student loan varieties. In fact, the major reason that I'm tied to this area and my current living situation is because of my credit card debt. I'm unable to change this at the moment, which I'd very much like to do. (New Year's Resolutions coming up soon! This'll probably be the most productive year in terms of those ever!) Ever since living in Philadelphia, I'm newly a city girl and would adore the idea of simply living in a fairly small apartment, and not wanting much more in the future myself. I also dream of living without a car, which, cost-wise, would mean no car payment, no insurance, no gas, no maintenance, no car wash, no interior vacuuming, no tickets or tolls, no cleaning supplies, no de-icer spray, etc! I could walk places or take public transportation, happily as I hate to drive. I know I can't go very far with minimalism however. Blank white walls, for example, are not my cup of tea. I studied art history for six years afterall! I need my art, especially now my small collection of street art of Italy. I believe it was The Everyday Minimalist who defined minimalism as just owning what you love, want and use. I can certainly adopt this looser definition! One that fits me and which facilitates the kind of life I want to live. 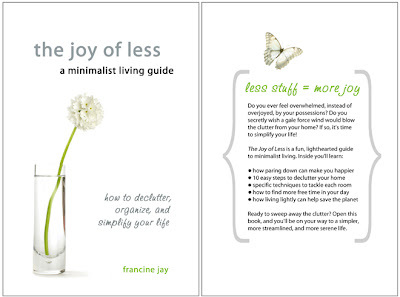 Today, Serena from TEM recommended miss minimalist's book The Joy of Less, a minimalist living guide: How to Declutter, Organize, and Simplify Your Life (by Francine Jay) in her blog entry. Using Amazon's "search inside this book" feature, I was able to read a sizable excerpt. As previously stated, I've already gradually started to apply minimalism in my life, like I form a small pile of stuff to donate each and every week for example, yet, I think this book will still teach me new lessons. Heck, I've already parted with some old high school stuff after being inspired by the excerpt! With its five-star rating, this book comes quite highly recommended. Since my county's library system does not have it, I hope to work its purchase into my budget and order it with my next paycheck this upcoming Friday. I hope to update you guys on my progress. I know the most difficult will be my big collection of "next apartment stuff." Will I give up a lot of that? I adore the idea of entertaining and can imagine myself as the perfect hostess, "domestic goddess" if you will. (I have given fabulous dinner parties in Philly and fun Superbowl Sunday parties and surprise birthday celebrations in college.) Anyway, over the years I have amassed a collection of items to entertain with. One of the biggest categories, if not the biggest, is glassware. I own at least four: champagne flutes, martini glasses, white and red wine goblets, and margarita glasses, and a couple of: double old-fashioned glasses and pilsners to name them off the top of my head, all stored away right now (since I temporarily live with my parents, ugh! There, I said it! ...and would rather not entertain here). Yeah... I can't wait to get started on my new year! 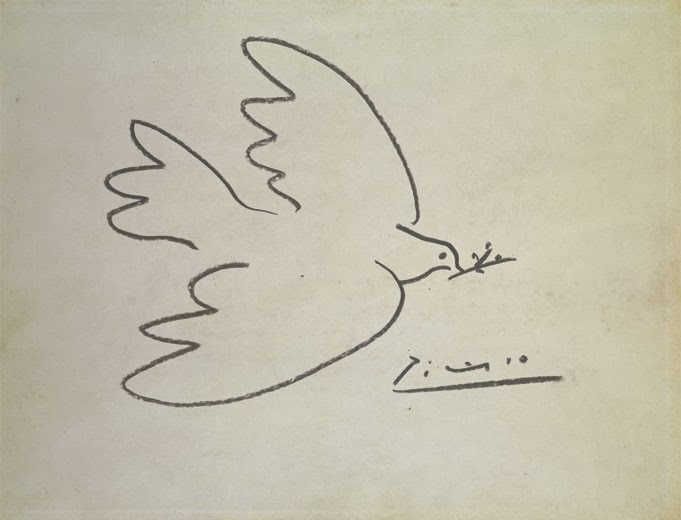 I hope it to be a year of great change, so stay tuned! This post is inspiring! 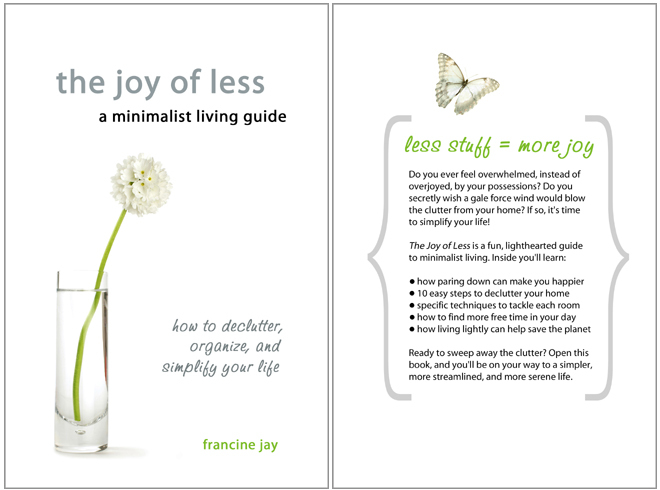 I'm on the minimalist journey myself but recognize I will never live in sparse surroundings. I do like to have the things I love around me, but only the things I really love. I think you can be a minimalist and still do this. Your love of art is a prime example. I used to have bright gold walls in my living room and recently painted it white. I have an art wall where all of my art is clustered on this one wall, hung close together and in no set pattern. the common denominator are gold frames, but the frames don't match. Some are ornate, some simple. the point is, the white walls make the paintings jump off and be noticed. I love it. Where I try to practice minimalism is in the everyday stuff. Entertaining items are interesting. Someday you will have some room to store things you don't use everyday, but try to pare down say the margarita glasses and use the highball glasses for those instead, or a simple juice glass. Even a martini can be put in a short glass. I do think champagne and wine deserve their own glasses though. I only have wine glasses that I put red or white in, nothing specialized for a particular wine. Glassware is a weakness of mine, it's hard to resist! Glad to see my recommendation is helping sell Francine's book!! Hey.. I'll be giving away my copy soon if you want to enter the contest. Hi! Thanks for dropping by my blog. I was just going to tell you if you that my glassware is very minimal and I served 25 people that night. I ended up using some bonne maman jars for candle holders AND glasses. I also had mismatched cloth napkins, etc. I believe entertaining is all about making do. I have 7 antique glasses and another 8 big pint classes and several juice classes for wine. That's it. And it worked. I actually prefer my wine in a juice glass. Anway, you could make do without all your glasses if you wanted. However, if you love them, then by all means make them a part of your life!